Luton interim boss Mick Harford was quick to pay tribute to the Town players after they swept aside Peterborough United 4-0 at Kenilworth Road this afternoon. James Collins bagged a second hat-trick of the season, while Luke Berry was on target too, as Town won for the first time since the Hatters legend took charge after Nathan Jones’ left to join Stoke City. 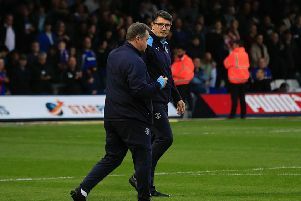 Although the visitors were reduced to 10 men on 25 minutes, Ryan Tafazolli dismissed for a foul on Andrew Shinnie, Harford said: “All credit to the players, they were absolutely different class in terms of the way they’ve trained, the way they’ve gone about things, the way they’ve acted since we lost our manager. “They’ve been totally and thoroughly professional and I take my hat off to them. “The three games I’ve been in charge, I couldn’t be prouder of them, each and every one of them. “The lads who haven’t been involved, they’ve been supportive, so overall I’d just like to give my thanks to the players. "The way they’ve worked, the way they’ve gone about their business, in the last seven to 10 days. “It’s been a bit of a whirlwind, but we’re delighted with the performance today, the win, the clean sheet. “People say did the sending off have a bearing on it, I thought we were in total control in terms of football-wise.